Hudl got a chance to speak with BJ Johnson this summer in Houston as he helped prepare the USA Basketball U18 team for the FIBA Americas U18 Championship in Chile. 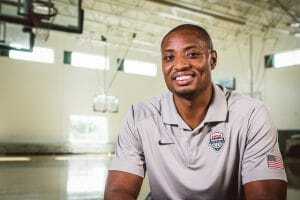 A former Villanova guard, Johnson has served with USA Basketball since 2005 and was elevated to his current position of assistant director in 2009. Here are some key takeaways from that chat. All three coaches on this staff are college head coaches, yet Mark Turgeon (Maryland) and Kevin Ollie (Connecticut) served as assistants to head coach Shaka Smart (Texas). How are these coaching staffs selected and how do they adjust? What is the common thread between USA Basketball coaches? What advice would you give to someone just starting their coaching career? What are some of the things that you look for when evaluating athletes for USA Basketball? What advice would you give a young athlete in how to study themselves?